There’s a buzz in the air at Stratford Circus Arts Centre. 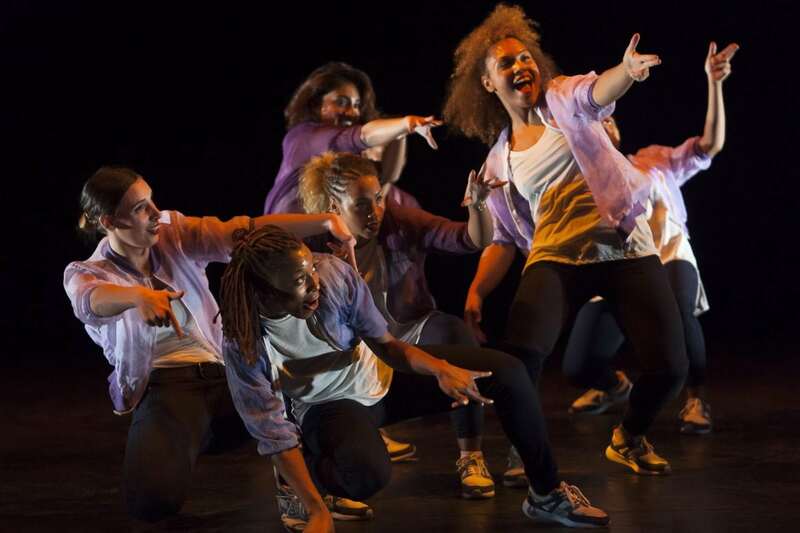 No wonder, this is the 10th anniversary of Collabo, Tony Adigun’s annual dance celebration founded in 2006 to promote new collaborations and hip-hop hybrids from dance groups. Friday’s program of short portfolios opens with 10 (UnTitled Dance Company) choreographed by Lukas McFarlane lasting fifteen minutes (no mean feat in the hip-hop world) and featuring 10 tracks and illustrating some super synchronised steps and gyros executed with military precision. The occasional, surprising rigidness of the choreography is broken by experimentation with spoken word. Liberation (What Is Written Dance Company) has the same exactness, but their more simple choreography is easier on the eye after the mass sprawl of 10. 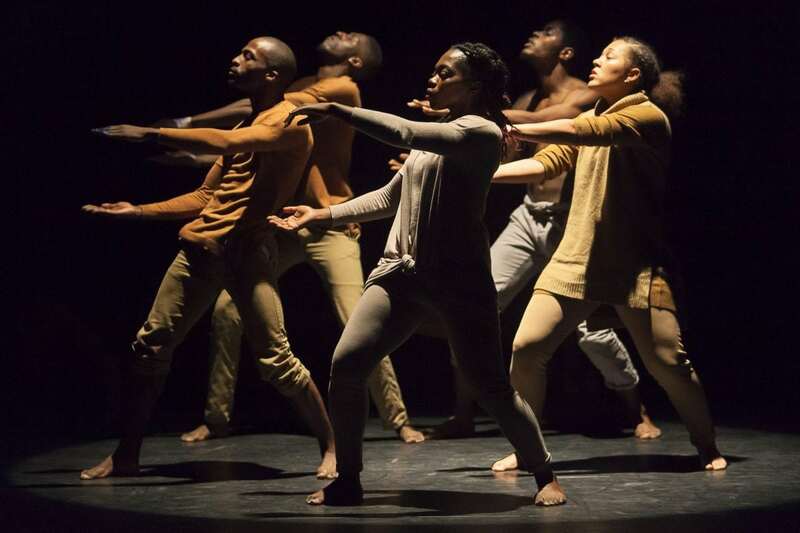 Kweku Aacht and Guest Dancers produce an interpretation of a track performed live onstage- the sometimes rowdy crowd shouting out and encouraging the performers on hold their breath as the troupe fluctuate between free style and more stylised sequences. Divine Tree by Avant Garde Youth and Westminister Kingsway feature some astonishing flips and turns and angular floor work and Jade Hackett’s #dancemarch film gives us the political context of hip-hop with some incredibly long dance sequence takes worthy of Wim Wenders’ movie Pina. Daer Skoob by Avant Garde and Avant Garde Youth may appear more traditional yet multigenerational, featuring a linear narrative and young boy of ten happy to go free style and who surely shows some early promise. IMD Legion, Rugged Estate and Avant Garde and Avant Garde Youth again give us some vigorous krumping moves, portraying nightmarish worlds and alienation with slick showmanship using light to give a sense of the epic and the universal. IMD Legion also gives us a hyper-extended muscled dancer’s bare back rippling in time to the music with a kind of ghoulishness that is beguiling and mesmerising to watch. Special mention must go to Love Yours by Just Us Dance Theatre and New Movementz and Musiac by More Than Movement. Love Yours, conceived by Three Brothers uses hip-hop, dramatic speech, acting and music to portray the frustrated and violent inner lives of young men on the cusp of becoming adults: the characters’ vulnerabilities destroys hard men stereotypes. Musiac, altogether different from everything else, is just beautiful and hot, fragmented and minimalist, like Peter Brook on crack. Diverting from the usual narrative of battle (a standard hip-hop format) here we have characters, voice overs and objects that take on magic surrealist elements. Though layered and indistinct Musiac is a beautiful story of loss, pain, togetherness and brooding violence. The two performers, Saskia Horton (nice to see a female taking an equal lead role) and Tyrone Isaac-Stuart have concocted a sleek, lyrical and explosive yet sombre piece that’s so finely crafted you don’t want it to end. This is theatre expressed through hip-hop and the star of the night. Collabo took place at Stratford Circus Arts from Thurs 10- Saturday 12th November and was presented by East London Dance. Previous PostWho is the Barnes White Bunny?